Helmets and clothing, new or vintage. A unique environment. The corner reserved for you is beautiful, relaxing and unique. Wooden floor, wooden bar, a rustic and comfortable that recalls the first place were built before Harleys. 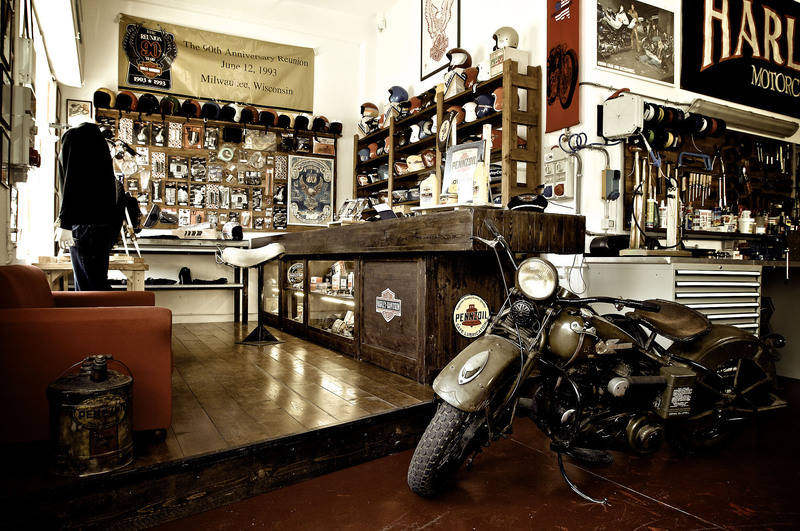 On the couch, you can browse the best catalogs for accessories, relax with a motorcycle magazine, or admire the memorabilia in the display cases under the counter, of course, all Harley objects. You will look and feel the clothing brand Vintage Cycle Service, such as jackets or t-shirts. You can follow the work done in the workshop thanks to a unique continuity of the environment. Vintage Cycle Service is the official dealer of Bell Helmets. We sell Biltweel helmets and for the really vintage’s enthusiast we have a selection of original vintage helmets. We sell KD’s motorcycle sunglasses and the cool bubble visors in several colors. From us you can find clothing with our Vintage Cycle Service logo. Comfortable jackets to ride a bike, sweatshirts, funny t shirts, sunglasses and hats.